It looks cheap as chips and connectivity is limited, but this entry-level UHD player will still make any 4K HDR TV shine. Panasonic’s DMP-UB300EB looks much like any other budget Blu-ray deck. It's ultra compact, just 320mm wide, and swaps a display for a lonely red power LED to signify that it's awake. Build quality is bargain basement. The difference is this is a disc spinner has Ultra HD Premium certification. Down market is the new high-end. The UB300 is built to a price. The front fascia comprises a disc tray and unbunged USB port. Rear side connections are stripped back to just a single HDMI output, USB 3.0 port and Ethernet. Perhaps surprisingly, cutbacks even extend to Wi-Fi support – there isn't any. You'll need a wired LAN connection to get this cheapie online. But when it comes to playback performance, things are rather different. Panasonic has shoehorned a Lexus engine into this Lada-like body. Panasonic may have wielded a cost-cutting red pen, but the deck’s video engine has escaped unscathed. 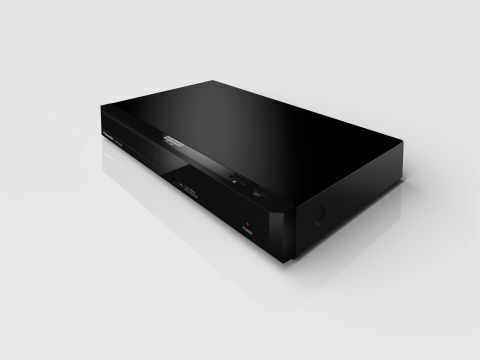 The UB300, which is HDR10 (only) compliant, offers top notch video playback. The deck features the same 4K High Precision Chroma Processor as its upmarket predecessors, the DMP-UB900 and DMP-UB700, but Panasonic has widened the number of output options. The UHD Blu-ray format mandates 4:2:0 chroma subsampling, but this Panasonic will interpolate to 4:2:2 or 4:4:4. For cast iron display compatibility there is a new Deep Colour 10-bit priority mode. If you TV exhibits colour banding effects with the default 12-bit output, select the 10-bit Priority mode instead. The flip side of these technical inclusions is that whether your TV is budget or bleeding-edge, the UB300 should have no trouble working alongside it. An interesting new display feature is adjustable HDR brightness. Accessed via a dedicated button on the zapper, it goes some way to combating the phenomenon of HDR dimness (in which High Dynamic Range images look overly dark in a brightly lit room). It essentially attempts to boost average picture brightness without sacrificing HDR dynamism. This HDR setting is adjustable between Standard (which is to say native), Natural Environment, Light Environment and Bright environment. The mode chosen has a surprisingly big impact on the image. Light and Bright modes progressively blow out detail, but Natural does a good job maintaining the original balance. Think of it as a daytime HDR option. When hooked up to a 4K TV without HDR support, Dynamic Range Conversion is enabled. This allows the player to tone map content to best suit the panel. There's a sliding manual scale between +/- 12 stops. It requires some experimentation, but if you keep to the low side you’ll avoid unwanted colour artefacts. The low cost chassis hasn't impacted disc loading speeds. A heavily authored Goldfinger platter goes from tray to menu in 44 seconds, while a stripped back concert disc plays in 33s. These are decent speeds for the format. Naturally, the UB300 will bitstream out the latest audio formats, Dolby Atmos and DTS:X audio. Your decoding electronics won't discriminate between this and far more expensive players. While it lacks high quality analogue outputs, there is also an HDMI low clock jitter processor. Network services available on the UB300 include Netflix and Amazon Video (both of which stream in 4K HDR), plus YouTube and BBC iPlayer. The deck will also act as a Media Renderer or network playback device. It instantly recognized the Twonky media servers on our home network and allowed us to navigate them with some speed. Finally, file compatibility is excellent. The deck happily played our DSD 2.8MHz vinyl rips (and DSD 5.6MHz downloads), along with 24-bit/192kHz FLACs, MP3, AAC and WMA. Video playback covers MKV, MPEG and MOV. In other words, for most file needs, it'll do the job. The picture performance of the UB300 is uncompromised. Its UHD images are blisteringly sharp. The addition of an HDR image optimiser is a welcome new feature, and the option of a 10-bit video output could solve issues for those with screens that don’t like the Panasonic’s big-science 12-bit interpolated output. The removal of Wi-Fi will be a hassle for many - you’ll need to use powerline or have a router or switch nearby to get online. The dumpy remote is a handful; it’s easy to activate Netflix by mistake. Build quality doesn’t exactly inspire confidence. The UB300 is an unabashed budget 4K UHD Blu-ray deck – and that’s exactly what the format needs: a player that can be priced low and even bundled with UHD TVs. While listed at £250 at launch, we don’t see that ticket sticking. The superior UB700 only sells for marginally more, and the Xbox One S is already cheaper, so expect the price to slide fast. The DMP-UB300 may not challenge the UHD Blu-ray elite, but it delivers where it counts. The compact form factor has obvious appeal, and its picture performance is a winner. Sure, it lacks finery, but that’s the point. Consider this a bargain worth bagging… when the price is right.